I’ve just returned from a week-long cruise with little access to wi-fi, so this blog has been silent. During that time, I have given it a lot of thought, however, and am steering it in a new direction, as I’ve written above. To begin, I will post some essays based on my week at sea. I am not a die-hard cruiser, so when I was invited to join a small group of journalists on board Holland America's Nieuw Amsterdam for a 7-day Caribbean excursion, I was uncertain about what to expect. Having completed the trip, I realize that any cruise is almost entirely dependent upon the cruiser. What you take from it is largely up to you. You can have 2000 people on board (as we did), and no two will have the same experience. Not even close. So I've composed a series of thematic entries that I will post over the next week or so, to give you an idea of what I experienced, and how the lessons learned might be of value to you should you be considering a cruise vacation of your own. Let's be clear – I am not able to compare this singular experience to many others, to say it was better or worse than what you might find elsewhere. But that is not the point. The point is that whether you are embarking on your first cruise, or your 100th, the cruise you take is equal to the cruise you make. In future posts I will talk specifically about options and tactics for maximizing the Dining, Drinking, Entertainment, Educational, Spa Amenities and Excursions that a cruise can offer. But first, let's talk about getting oriented. Cruise lines provide a tremendous amount of information long before you get on board. What helps you sort through all the options is to have your own priorities set in your mind. For me it was pretty simple. As a journalist I wanted to take advantage of every opportunity to sample life on the ship, and to re-think and develop new topics for this blog. As the sole wine blogger on board, it was clear that my particular focus would be on dining and drinking. As Joe Cruiser, I was eager to experience a break from my daily routine, and at the same time, stay fit and healthy. I set a goal to do a daily workout first thing, to eat very lightly at breakfast and lunch, knowing dinners would be substantial. I thought I would treat myself to the rare joy of reading a novel end to end, and as a musician (I brought my guitar with me) I wanted to sample the onboard music and do some playing of my own. With those goals in mind, the first thing I set out to do was to explore the ship, deck by deck. 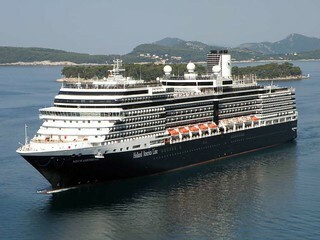 The Nieuw Amsterdam is a new ship, part of HAL's Signature Class. Among the many destinations and shops on board were a lavishly appointed spa, several duty free shops, a casino, an art gallery, a digital cafe/library, a Culinary Center, and a wide range of bars and restaurants. Apart from the big cafe and dining room, there are small white tablecloth restaurants serving Italian (Canaletto), Pan-Asian (Tamarind) and steakhouse (Pinnacle Grill) fare. The Culinary Center offers cooking demonstrations with a Caribbean theme. And though the many bars feature essentially the same drinks (more on that later) there are a few that offer unique specialties, and finding out where and what they are, as early as possible, seemed like a good idea. If you are a deep pocket traveler, cruise lines are happy to have you pile on amenities – massages, acupuncture, access to private cabana dining under the stars, use of the saunas and hydro-pool, and on and on. Take the time before you leave home to do the research and reserve whatever you can, as some may be filled up in advance. My first great discovery? The Explorations Cafe, with specialty coffees, a well-stocked library, and internet access (limited, and not cheap). I checked out a couple of books on the first day, and spent some happy hours there, sipping coffee, enjoying the view from the top deck, and reading in peace and quiet. My second great discovery? The Silk Den, a gorgeous bar across from the Tamarind restaurant. Reachable only by two small banks of mid-ship elevators, the Silk Den was both beautiful and blessedly quiet, especially during the late afternoon just before sunset. My third great discovery? Free room service! Order breakfast the night before, and dine on your private deck. No need to stand in line, share a table, or grin at every stranger who happens to pass by. On this ship, everything is spotless when you arrive, and spotless a week later when you depart. Without exception, every encounter with any member of the crew, the staff, or the entertainers was friendly, courteous and helpful. We ran into some rough weather on several occasions, and elaborately set-up events and dinners had to quickly be taken down and moved and set up again. All was done efficiently without a hint of complaint. At the end of the week, when news of the disaster in the Philippines reached us, there was every reason for the largely Philippine crew to become worried and distracted. I saw no signs of either. They maintained a stunning professionalism throughout. I quickly found that many of my impressions of cruising, based largely on experiences from 10 or 15 years ago, were entirely out of date. Which is not to say it is without its challenges. More on that later this week. Tomorrow – checking out the bars! It is extremely important to get oriented when cruising.